Here's a fun and easy Valentine's Day craft for your kids. Simply cut out the Valentine character body, arms, and legs, then attach with brass paper fasteners. Celebrate St. Patrick's Day on March 17th with this leprechaun pattern. Cut out the arms and legs and attach with paper fasteners so they move. Attach the feathers to the turkey's body. Kids can color the feathers and/or write what they are thankful for on them. Quick and easy November craft idea. Build a cute scarecrow with arms and legs that really move. Simply cut out the scarecrow parts and attach them with paper fasteners. It's that easy. Cut out Frank's arms and legs and attach them to his body. Cut out Skelly's bones and attach them to his body with brass paper fasteners. Cut out Santa's body, head, arms, and legs. Then, color and attach with paper fasteners. A fun December craft activity that kids love. Cut out the cute bunny and attach the arms and legs. Great for an Easter or spring craft. 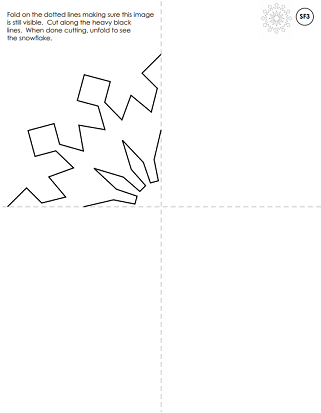 Fold and cut this basic snowflake pattern. Another basic snowflake pattern to fold and cut. Try this basic fold-and-cut snowflake pattern too. 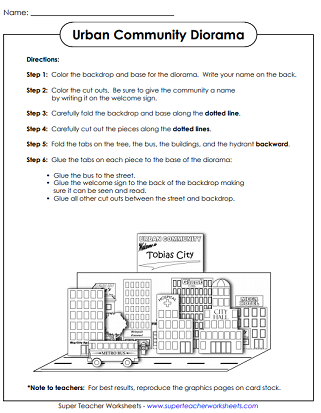 Color, cut, fold, and glue the buildings, bus, and other objects in this city scene. Create a suburban scene with houses, a mini-van, trees, a lamp post, a town hall, and a school. Create a rural scene with houses, a farm, cows, a tractor, a silo, and crops. This festive holiday diorama scene features Santa, an elf, and a reindeer. Cut out the ghost, skeleton, scarecrow, Frankenstein, and pumpkin and attach them to the diarama scene. Cut out the Pilgrims, Native Americans, turkey, foods, and table. Attach them to the diarama scene. Cut out the skater, hockey player, sign, snowman, and shove. Attach them to the winter scene. These cute animal puppets are perfect for play or student performances. Students could even write their own plays and perform them! More finger puppets - a man, woman, girl, and boy. Cut out the menorah pattern and attach the candles. Color the Hanukkah dreidel pattern. The cut it out, fold it, and glue it together. Printable worksheets for Halloween, Christmas, Thanksgiving, and all major holidays. Your students will enjoy making adorable holiday puppets from paper bags. 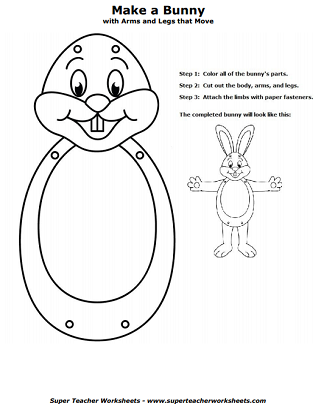 Use the templates to create a spooky Halloween skeleton, an adorable Valentine's Day bear, an Easter Bunny, and many more.